Newly Renovated 5 BR, 3.5 bath nestled in a central, welcoming and beautifully diverse community - in walking (and biking) distance to downtown Baltimore (Inner Harbor, Convention Center, Stadiums), University of Maryland Medical Center, BioPark, School of Nursing, School of Pharmacy. Enclosed patio is perfect for enjoying the changing seasons with friends or family. Car can be parked in enclosed patio area, too. Home is ready to welcome you with dishes, furnishings, window dressings, linens, local photo print art. Furniture is all from 2018 (mainly IKEA). Home has a full kitchen (stove, fridge, dishwasher, etc), a washer and a dryer. 2x monthly cleaning, and periodic lawn care are mandatory through trusted cleaners/ caretakers. High speed internet (wifi at all floors), Comcast cable, TV available. Utilties, i.e. gas, water, electric, high speed internet, Comcast cable can be included. 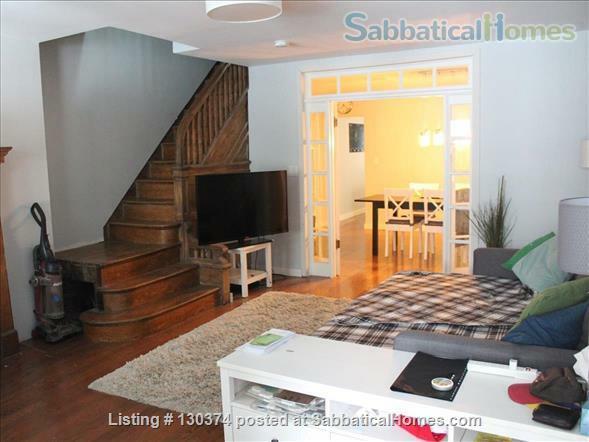 Ideal for a family or roommates with 3 larger bedrooms (+ 2 smaller ones) with 3 full bathrooms. As a German academic faculty, I am living and teaching in Germany. Through my US business I am in need for Baltimore and Philadelphia housing (seasonally) and have own property to rent.